10 days since we have seen it, I must close the doors and curtains - hide from the brightness of it. This strange, large, bright ball in the sky....it hurts us!!! I really prefer cloudy days, the heavier the overcast the better. It is going to be hard to live with hubby for a while. He bought me that humongous rain gauge on Friday, got it mounted in the back yard just as the rain was really starting to come down heavy and we got just over 4 inches of rain from then thru last night. He is certain he made it happen. The upside is we got just over 4 inches of rain. My hubby bought me a new rain gauge at the garden center today. He has trouble seeing the markings on the small one I have used for years and apparently translated that into MY having trouble seeing the markings since I am older than he is. I know he is trying to be helpful, thoughtful and sweet...... remembering that prevents me from doing him bodily harm. thank your lucky stars that you don't have to hear me tho. We are only getting about 1/2 inch but it has been a slow steady rain almost all day. Of course this was the first chance I had to go to one of the best native/organic nurseries in the county. The herb section is covered so I was able to shop and stay fairly dry. It was certainly pleasant listening to the rain hitting the plastic roofing and the ocassional splash of water hitting the top of my head and running into my eye was fun......no really, I truely enjoyed it. Next week will be wonderful gardening weather here, close to 80F by the end of next week. Winter is here. Only three months late and only 4 days long but I was afraid it had forgotten us completely. 24 degrees F outside with a wind chill of 11 degrees now. Supper of red beans with rice and cornbread.....hubby will be making lattes later and I am starting over for the 4th time on a sweater whose gauge I just can't seem to get correct. Grandsons are here for the weekend, they are playing video games with my youngest daughter and eating supper. We have two crepe myrtles between the sidewalk and the street that I trimmed yesterday morning. I do NOT cut them way back as appears to be the way the so called landscapers say it should be done, most landscape experts call that crepe murder. Mine are just trimmed enough to keep them from scratching cars parking in the street and let people walk down the sidewalk by them without having to double over to do it. We will be taking out the remains of the original shrubs next to the house. They were planted when the house was built and are way too high maintenance. I want to replace them with an assortment of native grass plants, then work on filling the rest of the yard with native plants. 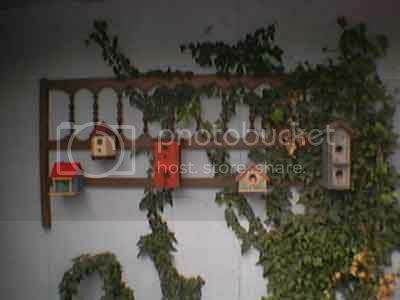 We had a king-size bed headboard in the backroom for several years that my daughter didn't want with her bed, so we attached it to the back wall and started adding the birdhouses. The two on the right have seen many babies over the past 5 years, especially the smaller one. One Momma sparrow hatched at least 10 babies in it between April and June of last year. The red two story one in the middle must be cursed or may sparrows don't like the color red, it has been there as long as those other two but never been used. The two on the left were just added last month, but already have had Mommas checking them out for their families this spring. The houses face east so they get the morning sun in early spring, then when the large pecan tree nearby leafs out they are shaded from the summer heat. The eave overhang is quite deep so they are protected from the rain too. My washing machine and dryer are in the back room just to the left of that wall and with the window open in spring I can hear the babies cheeping and keep an eye on their progress while doing the dreaded laundry. Last Saturday (Jan 28) we had just about 1.5 inches of rain and it was wonderful. No drought breaker but it was nice. After that the weather people stated that they didn't see anymore rain in our future, at least for the next 7-10 days, since February is typically one of our dryer months. Heck, the last 10 months have been dryer than the normal February. They did forecast a cool front to come thru last night, dropping the temps from the 70's(f) down to the 40-50's(f) for today but any rain that came with it would be well to our south and east....we would remain dry. Last night I needed my hubbys muscles and pickup truck for a trip to Home Depot for mulch, a new rake and a few bits to put together an arbor this weekend. Got the things at the indoor part of the store and headed out to the enclosed but unroofed garden center. Loaded bags of mulch on the cart and I happened to look up to see the sliver of the waxing moon surrounded by a mist. Aha, that means rain within 24 hours. My hubby works at home two days a week and this week his home days are Thurs and Friday. So this morning when he got up he heard it and immediately woke me since he knows how much I love to watch it........RAIN!! The sky is getting lighter now and the rain has almost stopped but my rain gauge out back has just a bit over 1/2 inch in it and I am happy.